The Hornby Island Eagles are the guests of honour as friends, Leza and Carol, skype over morning tea, Carol in White Rock, Leza in Oliver, Mom and Dad Eagle on Hornby Island, BC. The friends watch the building and feathering of the nest. They laugh as Mom and Dad argue over decorating - Dad will put a good stick here, Mom will move it over there. Carol and Leza patiently await the laying of the eggs. Like two proud grandparents in the waiting room, they count down the days and hours to the hatching - all the while commenting on how well Mom and Dad Eagle snuggle, gently turn and protect their wee offsprings’s eggs. When the Eaglets finally break through to the world, things really get serious for these friends. It is cigars and baby shower celebrations all around! They laugh at the fuzzy little shapes with the very big feet; worry about who is getting all the food and who isn't; and are fascinated by the care and feeding exhibited by these huge birds of prey as well as the gentleness of their parenting. The friends are glued to the webcam from the nesting through to the awkward teenage times to the ultimate bravery of that first flight. This is Mother Nature at her best. 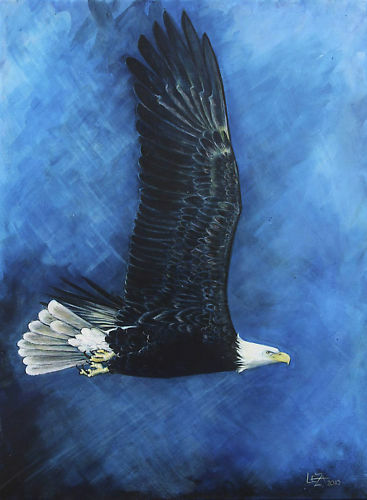 As a thank you for the hours of pleasure these two friends have experienced, Artist, Leza, has painted “ Phoenix Rising “ - an 18" x 24" acrylic painting of a mature Bald Eagle in full flight - in honour of these magnificent birds. “ Phoenix Rising”” will be auctioned off on E-Bay with net proceeds to go to the Hornby Island Eagles site for future research and webcam maintenance. Leza would like to fund the installation of a lens cleaning apparatus to prevent the "fouling " of the cam by the little ones. “Phoenix Rising” will be auctioned on E-Bay from Friday, April 22 to Sunday, May 1. The first hatching is expected Friday, April 29, 2011. We must all join together to protect not only these magnificent birds but all of Mother Nature’s gifts to our planet. This is a good way to start. The Hornby Island Eagles webcam is one of the great educators and acts as mankind’s eye on what is really happening in nature. This auction is how Carol and Leza have chosen to help. Please join them in their quest. ****HEGPS would like to thank Leza and Carol for their generosity and patience. Knowing the special meaning that this lovely painting will have for the proud owner, will only increase the importance of owning this beautiful work of art. What a majestic painting. I love the overall blue tones. This a big painting - two feet tall by one and half feet wide! Beautiful, and I'm so glad it's Phoenix. It's a lovely painting, along with the love that went into creating it, thank-you. The painting is beautiful! Soon, a very happy person will have it to treasure, thanks to the very generous gift from artist Leza and fellow donor, Carol. So far, there have been 4 bids on the painting with 8 days left. current bid is $222.50 and still 6 days left Beautiful painting, and such a generous donation to HEGPS, we are truly thankful. Bid of $350 is holding with just 12 hours left. The last and winning bid on May 1 for US $405.00 (approx. Cdn. $384.26) was at 23:50:56 EDT. Great news someone will be very happy to have that beautiful painting. BBE why isn't higher in Canandian dollars since are loonie/dollar is higher than American dollar. Congratulations to the winner of an awesome painting! Many years of enjoyment on your wall. Congratulations to the lucky winner of this gorgeous painting! We would like to thank friends, Carol and Leza MacDonald, for their thoughtful and generous donation of the lovely painting "Phoenix Rising". Leza, the very talented artist, painted this painting in memory of our Phoenix and placed it for auction, with proceeds to be donated to the Hornby Eagle Group Projects Society. We would, also, like to thank all of those who particpated in this auction. Someone will now have this wonderful original artwork to commemorate the legacy of Phoenix.